UPDATE: The show just got picked up for a full season! TV show equation: Jane the Virgin = telenovella / Spanish language + occasional Spanish language x better production quality x cheeky self-awareness. Premise in a Sentence: At its most basic, Jane accidentally gets artificially inseminated after spending her life maintaining her virginity. But this show has gone absolutely bonkers. In the best way possible. She was inseminated with a sample from her boss, Rafael, who she also had a romantic moment with 5 years ago. Jane had gone in for a simple exam, but her doctor, Luisa, was discombobulated after walking in on her girlfriend cheating on her. Luisa realized her mistake when she walked into her next appointment and saw her sister-in-law, Petra. Oh, yeah, Luisa is also Rafael’s sister. Also, Jane’s boyfriend, Michael, who she has been holding off for two years, proposes in the midst of all this. I think that is all I am going to give you for now, because some of the other reveals are far too delicious to spoil for you and I really want you all to give this one a shot. Even though it has only had two episodes, I’m going to go out on a limb and declare this one my favorite new show of the season (the only possible competition is Marry Me, which get the Happy Endings bump). If you are anything like me, you heard the premise or saw the promo and had to keep from rolling your eyes, but this show won me over in it’s clear awareness of the ridiculousness of the premise. If you watch some of those more soapy dramas like Scandal and Revenge and find yourself thinking “Oh, boy, that would never happen in real life but I love it anyway”, then you are really going to like this one. The show’s humorous narration basically calls out how unbelievable some of the plot can be and to great effect. This cheeky quality helps the plot to be a lot more fun, but it also helps the show to have tender moments without getting too schmaltzy. 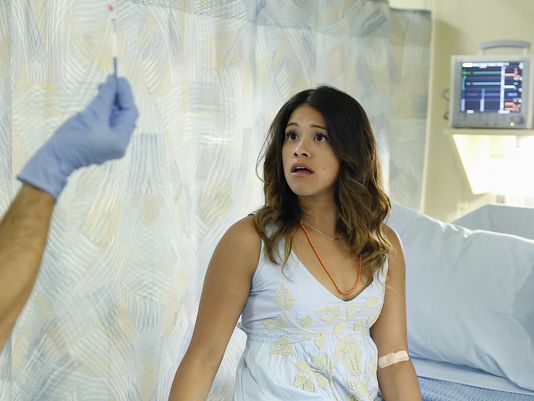 Gina Rodriguez plays the titular Jane with a lot of heart and strength. Jane’s romantic entanglements are already promising to be intriguing and the other relationships already range from sweet to over-the-top scandalous. I triple dog dare you to get to the last 10 minutes of last night’s episode, in which they dropped at least 5 bombshells, and tell me that you are not hooked. You can’t turn down a triple dog dare.